A small brass plate by the door is all that announces my venue for the evening, a gorgeously dark and cosy dining room hiding at the end of a long corridor. Think log cabin, animal pelts and candles. 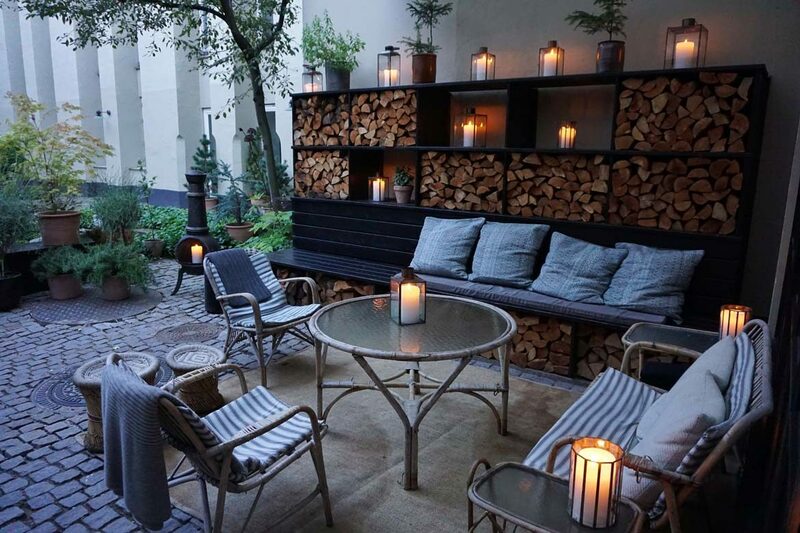 Très Nordic. One might even call it rustically romantic. 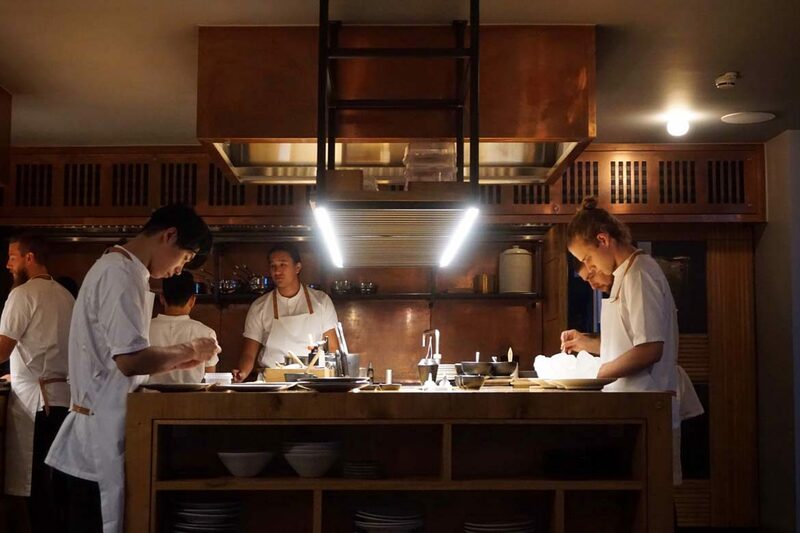 In a city with as much excellent food and creative artistry as Copenhagen, the fact that Kadeau has snuck into the World’s 50 Best top 100 at 94, the third in the city to make the top 100, is no mean feat. 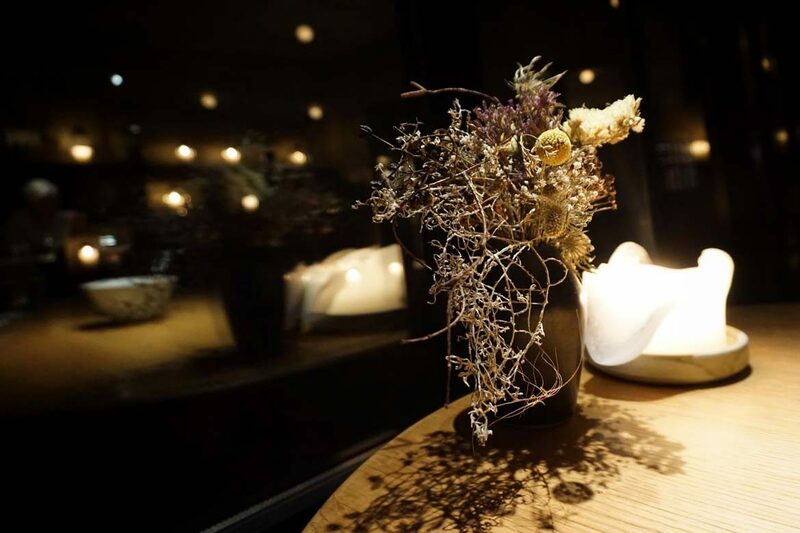 Having just enjoyed a spectacular meal at Geranium, I was eager and excited to taste Kadeau’s offerings. Kicking off festivities with a very interesting and rather wonderful sorrel, rowan and rosehip bitters cocktail in the welcome lounge, the bustling open kitchen hints at some seriously cool food to come. 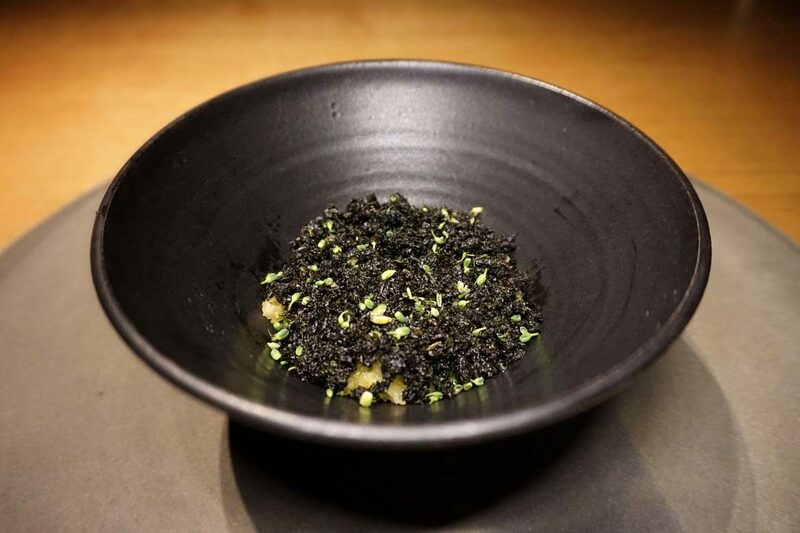 I wasn’t expecting the first dish to be literally as cool as the apple balls presented on a gorgeous plate of ice that heralded the start of the meal, but puns aside, it definitely falls into that New-Nordic-hipster category that one expects in Copenhagen. For all the technique that no doubt went into this petite dish, however, the apple balls simply tasted like raw Granny Smith apple. I rather think a lot of effort could have been spared by simply serving apple slices and achieving the same effect. 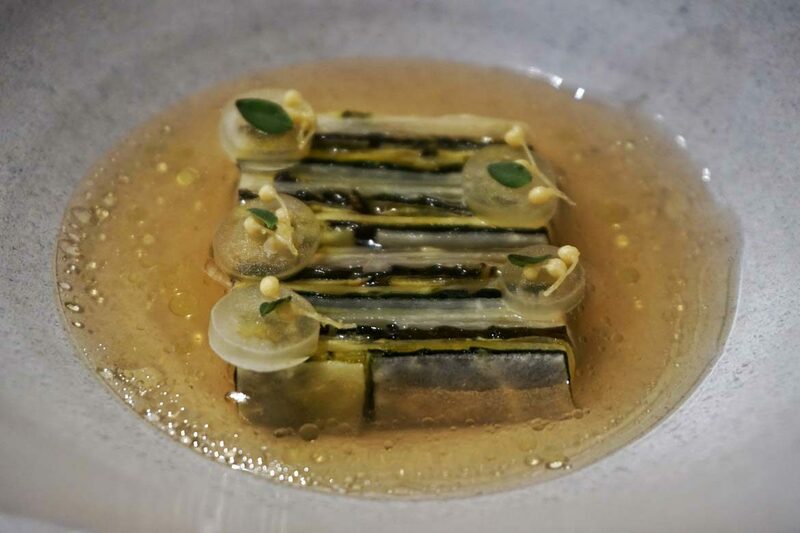 If you’re a fan of that sour, acidic flavor of Granny Smith apples, or perhaps a sour-worm aficionado, then the courses that followed would surely have you dancing on the tabletops (if such a display of enthusiasm wasn’t totally out of place in the chilled out Danish city). 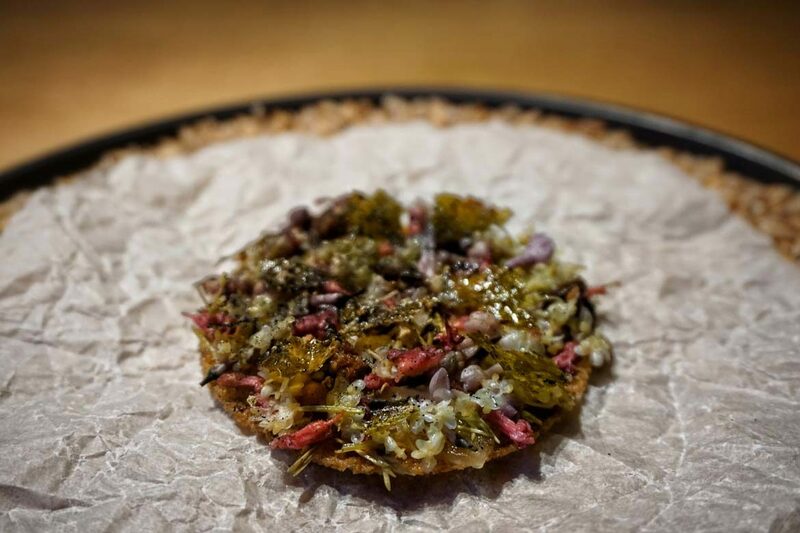 A pizzette-of-sorts topped with various pickled vegetables again goes heavy on the sour note, and a stunningly gorgeous dish of paper thin pickled vegetables sadly delights in visuals only (but isn’t it beautiful). A bowl of broccoli and beans cooked in fig leaves follow, the only dish of the evening that I manage to finish, before the sour and acidity factor is back at 11 with a dish of picked mushrooms and a slightly more palatable (and very pretty) tomato tart. 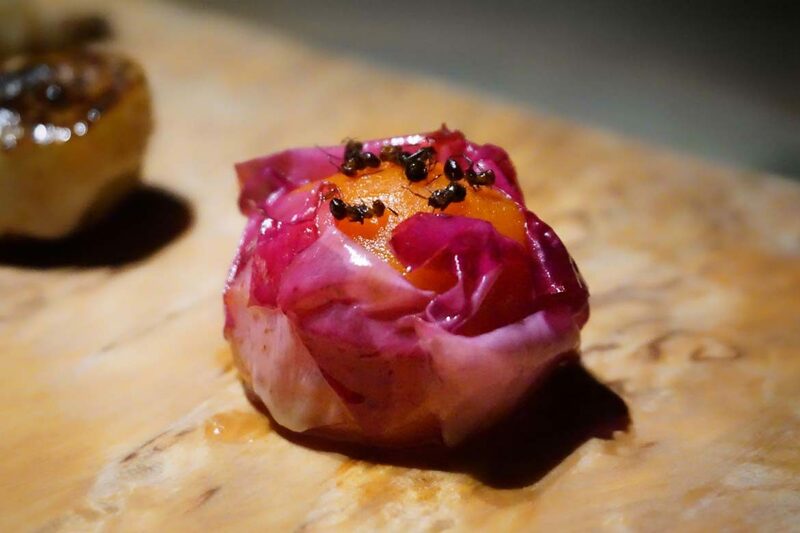 I find myself continually mentioning how beautiful the food is at Kadeau, because it really is a feast for the eyes. 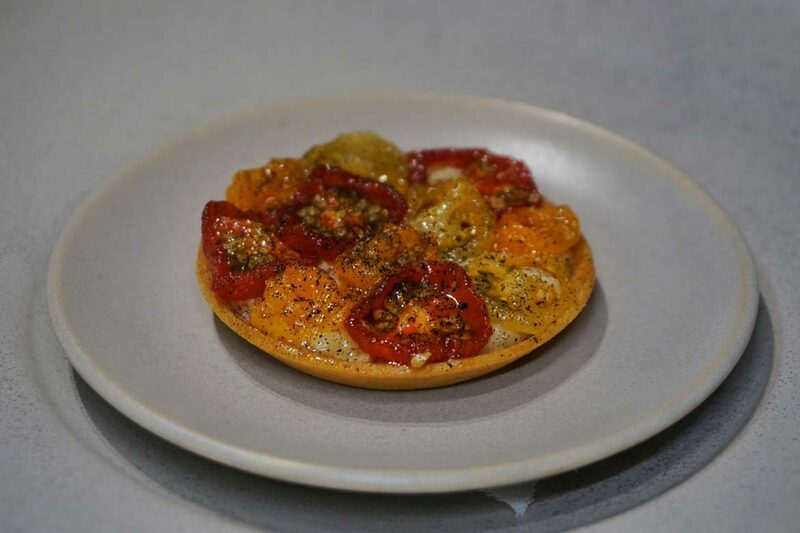 The amount of work and precision that has gone into painstakingly placing each ingredient is evident, and I feel bad for not being able to enjoy the flavours as much as the presentation. 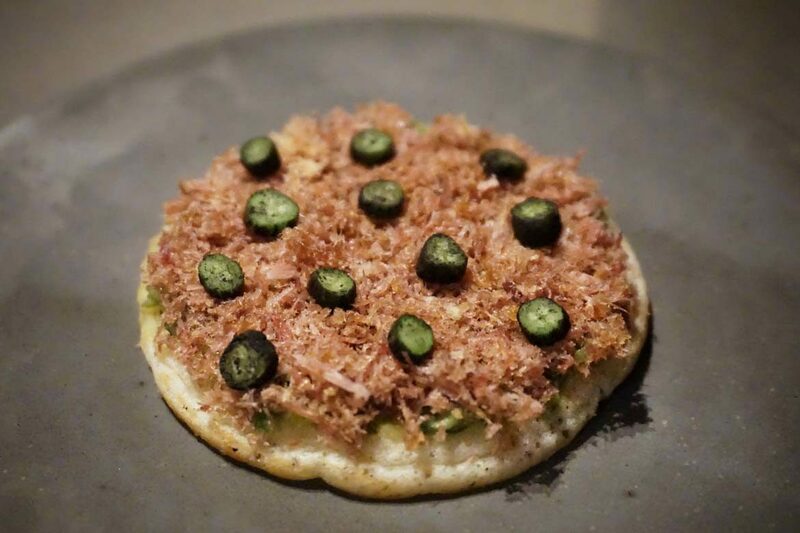 A trio of vegetables is next, including a rose covered pumpkin bite topped with ants (because, you know, Copenhagen) which delivers far too much soapiness from the pretty pink petals, and I hit the wall with a shaved duck breast and pickled cucumber pancake after a solitary bite. 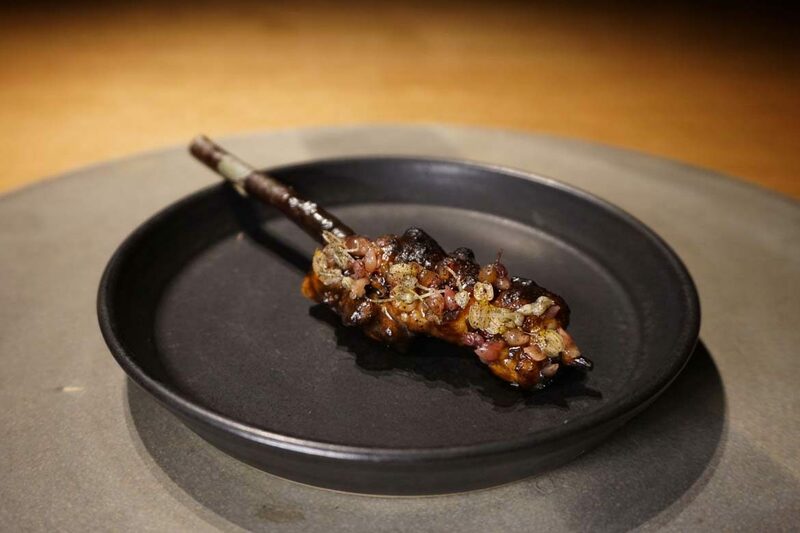 Now a tad on the hungry side, I tackle a strangely acidic teriyaki chicken skewer with as much waning enthusiasm as I can muster by this point in the meal, and get rather excited by a delicious looking cut of beef arriving at my table. Whilst tender and flavorful, this dish is, heartbreakingly, salty to the point where I can’t finish it – and this comes from someone who loves salt much, much more than the average Joe. A gorgeous wedge of roasted celeriac with butter sauce again makes my foodie heart jump for joy on its arrival, only for my hopes to be dashed at first bite with another inedibly salty dish. I love salt, so it shocks me if I can’t finish a dish due to saltiness. I’m also a massive fan of celeriac so I shed a tear internally at not being able to devour this dish with the enthusiasm it deserves. 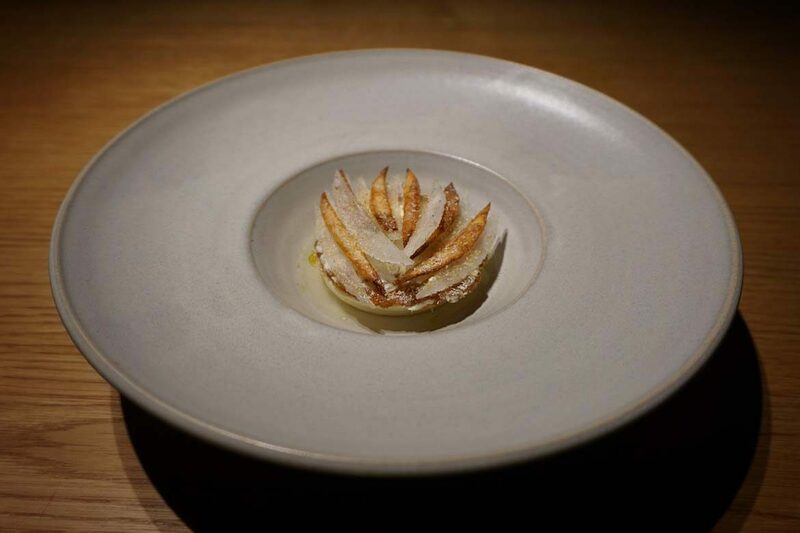 I’m intrigued as to what the dessert courses will bring at Kadeau – but much to my disappointment, it was back to sour and acidic yet again. A little more balance on the desserts, a touch more sweetness and they would have been fantastic, especially the rather interesting parsnip tart that I wanted to love so badly. 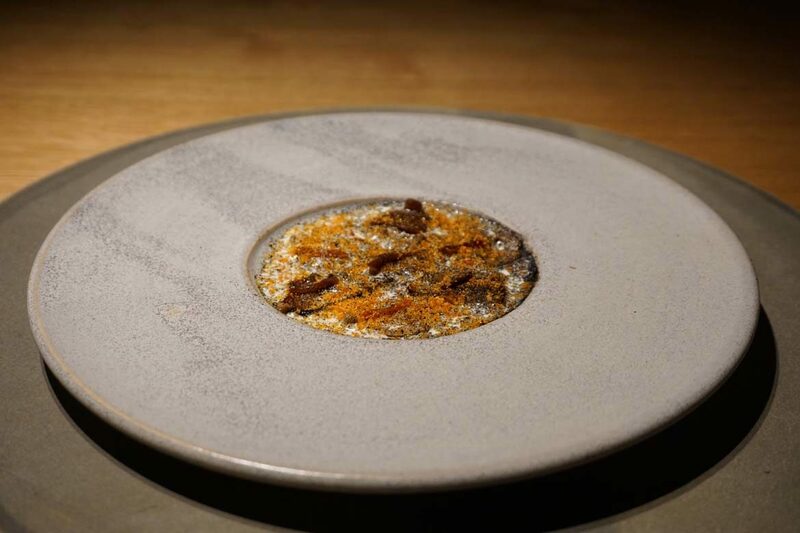 Feeling more than a little mournful by the end of my Kadeau journey (and crushed by the amount of food I’d left on the plate throughout the course of the meal), I resign myself to the fact that I’m just not cut out for this über Nordic flavour profile. 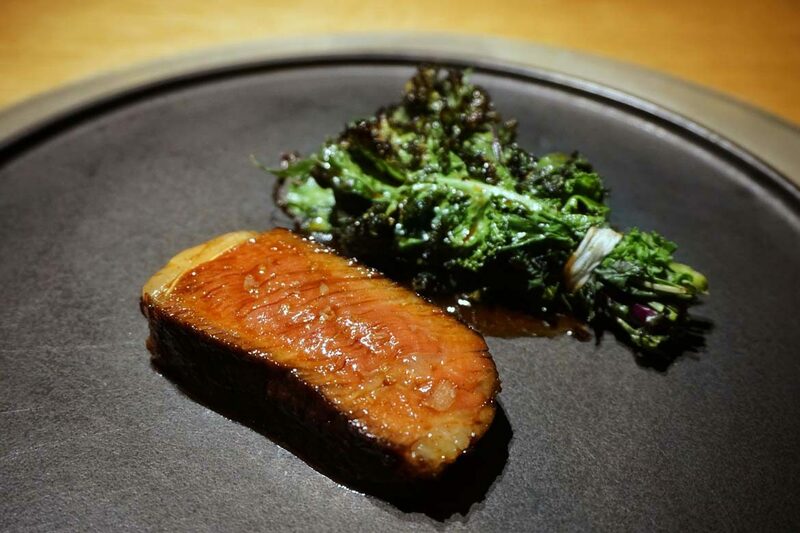 Flavour balance is probably the most important aspect of a meal for me, and it was sadly very off kilter in this experience. The meal leant extremely heavily to the acidic, bitter and sour side, lacking the umami and sweet notes I crave to counter these strong tastes. 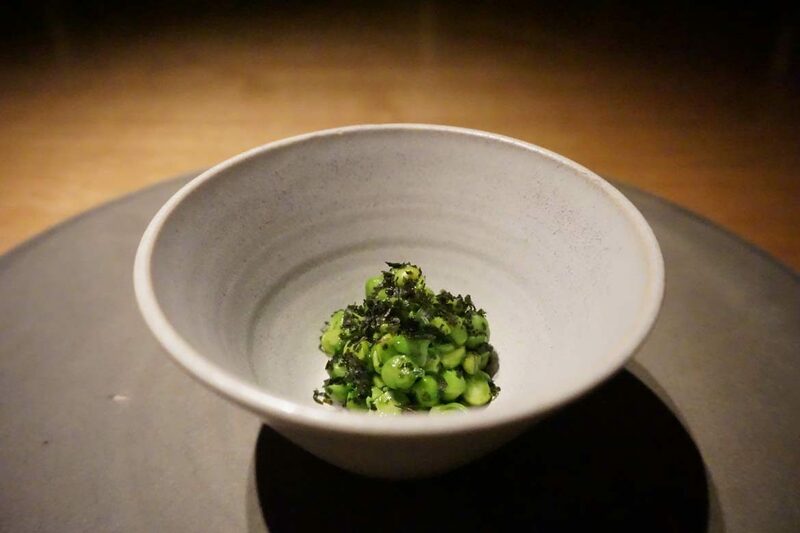 As I prepared to wave the culinary white flag in surrender, I wistfully reminisced about the masterful way in which ex-Noma Chef Jacob Kear navigates this balance at Clooney, and the delicate and delicious flavors I had just admired at Geranium. It deserves a mention that service was lovely throughout the night (unlike the strangely unpalatable tap water served, which apparently receives a lot of comment) but it did puzzle me that a restaurant of this level didn’t strongly question why a diner is leaving so much food untouched on the plate, many dishes having had just or two bites removed. 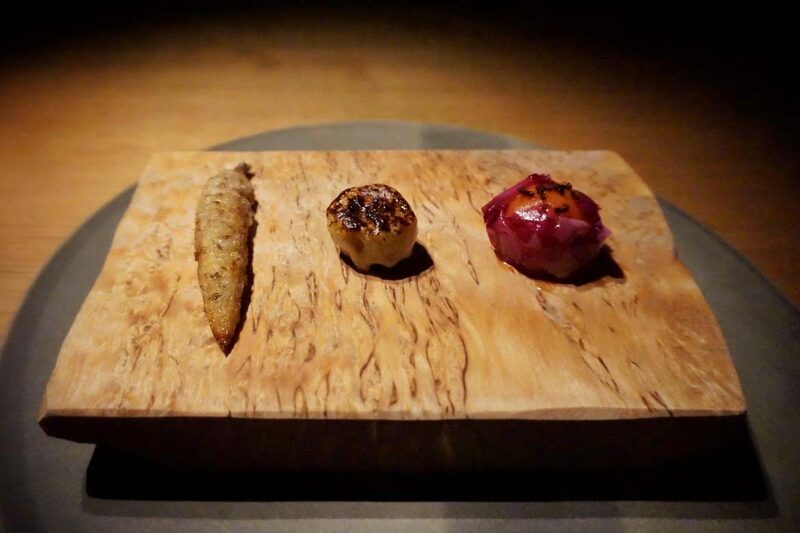 I know the eagle eyes of world’s no.1 restaurant, Eleven Madison Park, would have been onto this from course one, and not stopped until they had a happy diner – just one reason why they are in the top spot and recipients of The World’s 50 Best’s Art of Hospitality award. All this being said, however, we all know taste is subjective and so personal. 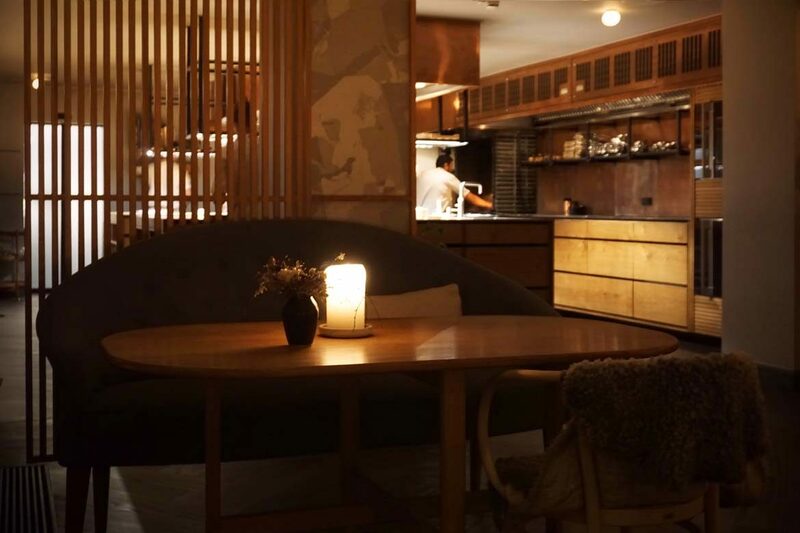 Fans of Noma and Melbourne’s Ides (both elicited a somewhat similar reaction from me) will likely delight in the style of cuisine Kadeau is conjuring up in their fiery Danish kitchen. If you’re addicted to acidity, this will be your cup of tea, so to speak, albeit a very tart and bitter one. But at a hefty1800DKR (240 Euro), I would advise having a long think as to whether these flavors are your thing before investing this level of cash.